This circular compendium has a single cover and is fitted with a suspension ring. As on other Schissler instruments, the signature appears within an engraved band around the outer circumference of the box: 'CHRISTOPHORVS SCHISSLER SENIOR FACIEBAT AVGVSTAE VIN: Ao 1608'. The top of the cover has a lunar volvelle and aspectarium titled 'IN.CREMENTVM . ET. DECREMENTVM . LVNAE.' There is a fixed scale of hours I to XII, I to XII, each hour divided to 1/2. This hour scale surrounds the volvelle which has a rectangular aperture at its edge through which the scale of the moon's age can be seen. Rather than the expected range of 0 to 291/2, the scale only goes to 21/2. The 0 of 10 has also been omitted. The volvelle's scale of hours runs 1 to 12, 1 to 12, each hour divided to 1/4. The volvelle has a circular aperture to reveal a diagram for the phases of the moon, with a full moon face. The face is unusually formless, and it may not be entirely fanciful to see it as aged and perhaps even malevolent. There is also an aspectarium of polygons and symbols for trine, quadrature and sextile. The volvelle may not be original. The numerals are engraved rather than punched, and their shapes do not match those usually used by Schissler. The symbol for sextile is more flower-like than is normally found on Schissler's instruments. The aperture for the age of the moon is closed whereas the outward edge is usually left open and the stud projects more sharply and prominently than seems familiar. If the volvelle is a replacement, the central retaining nut is likely to be too; in its present form it has a smaller hole than is usually provided to accommodate a wind vane. The reverse of the cover carries a map of Central Germany, centred near Erfurt with Augsburg at the south, Kassel west, Gorlitz east and 'WOLSNAH' north. The map's relatively restricted range gives a sparser density of towns than is found on other Schissler maps. Around the circumference of the map is a scale of eight directions in which the west point was incorrectly marked and has had to be corrected. Unlike Schissler's other map indexes, the rotating index is a plane rule, without slot, sliding cursor, or direction pointer. If the cover's volvelle and retaining nut are replacements, it is highly likely that this index would have been fitted at the same time. The main box holds an inclining sundial with a folding gnomon sprung to the vertical by a ring on the underside of the dial plate. The hour scale runs 4 to 12 to 8, each hour divided to 1/2 and dotted to 1/4. The plate turns on two pivots and when depressed reveals the latitudes scales against which its inclination is set. When depressed at north, there is a scale from 33 to 48? at 3? intervals; at south the scale runs 48 to 60?, again at 3? intervals. The compass bowl is integral with the dial plate and inclines with it. Its silvered base plate has a direction cross marked 'SE', 'ORT', 'ME', 'OCC'. 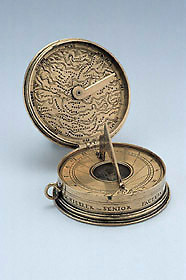 The base of the instrument has a circular table of latitudes in which the place names radiate out from the centre. Latitudes are given in round degrees and the places include towns in Germany, the Low Countries, Italy, France, Iberia (including '41 PORTVGA. '), as well as both London and '53 OXENFO:' for England. At its centre, the base has a small hole.